Cannon Equipment has pioneered a number of cart-based product distribution systems for the newspaper industry with automatic cart and dolly loaders which provide further efficiencies in handling newspaper products transported on wheels. 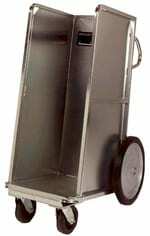 Whether you load carts by hand or machine, carts provide more finely targeted zoning capabilities than pallets. CannonCarts® are easier to use and do not require specialized equipment such as forklifts and pallet jacks. 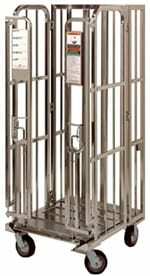 Our patented E-Z Lock CannonCarts® offer maximum bundle stability. 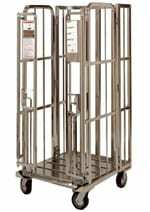 These heavy-duty newspaper carts feature locking doors to secure loads during transport. While operators can easily lift either the door or the latch to open the cart for manual loading and unloading, the doors are also compatible with the Cannon Equipment NCL series Cart Loaders. Product retention is further enhanced through a unique tilt-back feature that slants the shelf and framework. 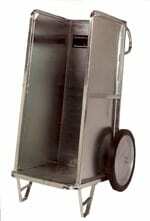 Cannon Equipment is one of the leading manufacturers of material handling carts in the newspaper industry. Contact your Cannon Equipment representative and find out how we can design a custom cart system to meet all of your specific needs.